The thing about Zack Snyder is that he’s always completely into everything he puts on-screen. He has tons of enthusiasm for everything—including making sure that Henry Cavill snapped Michael Shannon’s neck in Man of Steel exactly right. In a featurette about Man of Steel which only the truest of fans have probably watched, Henry Cavill twists Michael Shannon’s neck in a rehearsal for the now-infamous ending of Man of Steel. Film director Zack Snyder looks on and says with disapproving snark, “What is that? 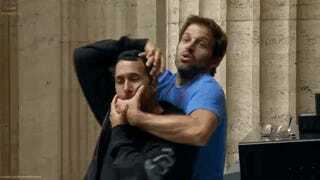 !” Snyder decides he needs to step up and show Superman how it’s done. And Snyder himself figures out exactly what the movie needs, exclaiming “That’s the ticket!” as they get it exactly right, “it” being the ending of Man of Steel where Superman kills a guy. Everyone is having so much fun on set, you almost don’t want them to know how angrily people are going to react to the thing they’re practicing. On the other hand, if they did know, maybe DC’s Murderverse would be set on a different path. A better, less murder-y path.